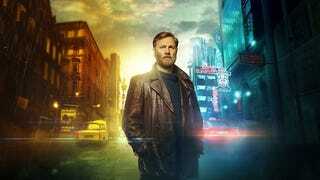 The last month or so, Auntie Beeb have been taunting us Brits with a cryptic, almost hallucinogenic trailer for a cop show staring Britannia’s David Morrissey. If you saw the main page yesterday, you will know that next week (April 6th) BBC2 will be treating us with an adaptation of China Miéville’s mind-bending novel The City & The City. As Auntie says, Tony Grisoni (The Young Pope, Southcliffe, The Red Riding Trilogy) has adapted this four-part genre-busting thriller from one of Britain’s foremost fantasy writers in a production made by Mammoth Screen and directed by Tom Shankland (Les Misérables, House of Cards,The Missing). David Morrissey is Inspector Tyador Borlú but the cast also includes Lara Pulver (Sherlock) as Borlú’s wife Katrynia, Mandeep Dhillon (Some Girls) as Constable Corwi of the Besźel Policzai, Maria Schrader (Deutschland 83) as Senior Detective Dhatt of the Ul Qoma Militsya, Ron Cook (Hot Fuzz) as Borlú’s superior Commissar Gadlem, Danny Webb (Humans) as hard-right nationalist politician Major Syedr, and Christian Camargo (Penny Dreadful) as Doctor Bowden, an American academic. “I didn’t know China Miéville personally but I knew his work and I was really interested in what him and a few others have termed ‘weird fiction’ which is this version of science fiction that tends to be anchored in the reality we all experience from day to day but has a slight kink that makes you reappraise it, so you look at things in a slightly different way. How do you start bringing these cities to the small screen? “One of the most obvious challenges was the notion that you have two cities which coexist in the same geographical space but which are separate because people are taught from birth to unsee the other city. So it isn’t a parallel world where you could cut between two realities or cities or worlds, it is one where the two are constantly in existence, in the same space. I am not a big fan of CGI because I am more interested in an emotional response to things rather than literal visualisation and this is a good example of trying to do that from the outset. “I used point of view; the story is being told mostly by Borlú, the main character, so I decided we would see what he sees. He lives in the city of Besźel and he sees Besźel so we see that too. There is talk in headquarters about the existence of this other city but you don’t see it, except when he breaks the law and has a little peek at the other city and you visualise him doing that or if he is in an emotional state and the membrane between cities dissipates to a degree. How does the TV version differ from China’s book and how do you make those decisions? “There are various differences between the screenplay and the novel. The first thing to remember is they are two different languages, though on the surface they appear very similar - using words, sentences and punctuation - the language of the screenplay operates in a completely different way. The screenplay is part of a process; it is not a complete thing in itself as a novel is. A novel includes interior monologue, which is something that doesn’t exist in a screenplay (other than through voice over but even then it operates differently). So things must change and China was very generous, curious and very supportive all the way through. We had several meetings when I was asking questions, trying to understand the novel better, testing out various ideas on him to get his input and that was a real help. “One of the things is that in the novel Borlú has two girlfriends who he doesn’t really see very much but I became interested… it felt to me like there was a wife somehow in his past. Very often these changes aren’t something I bring to the novel but something I might find within, a kind of archaeology in a way - a feeling that exists somehow in the texture of the novel. That applied to the idea of Borlú’s wife and once I decided that, what interested me was that there was now a further division: Borlú lives in this twin city and also has a past life. I got interested in the idea of his past impinging on his present which created another membrane, another divide - or threat in the way the past might invade the present. Also, David Morrissey gave Borlú an emotional core - a man who needs to believe in black and white - that kind of policeman - but the woman he chose to spend his life with was the exact opposite of him.